The spark that became today's Special Olympics movement ignited at the first 1968 International Summer Games in Chicago, Il., USA. Five decades later, we returned to Chicago to launch the year-long global Special Olympics 50th Anniversary celebration. Special Olympics International, Special Olympics Illinois and Special Children’s Charities in Chicago united to host nearly a week of exciting events that celebrated the first 50 years of Special Olympics and launched the movement into the future. Events included the first-ever Special Olympics Unified Cup; a star-studdedGlobal Day of Inclusion; a Law Enforcement Torch Run Commemorative Run; a ceremonial lighting of the Special Olympics Eternal Flame of Hope, which symbolized our burning passion for inclusion and justice for people with intellectual disabilities. 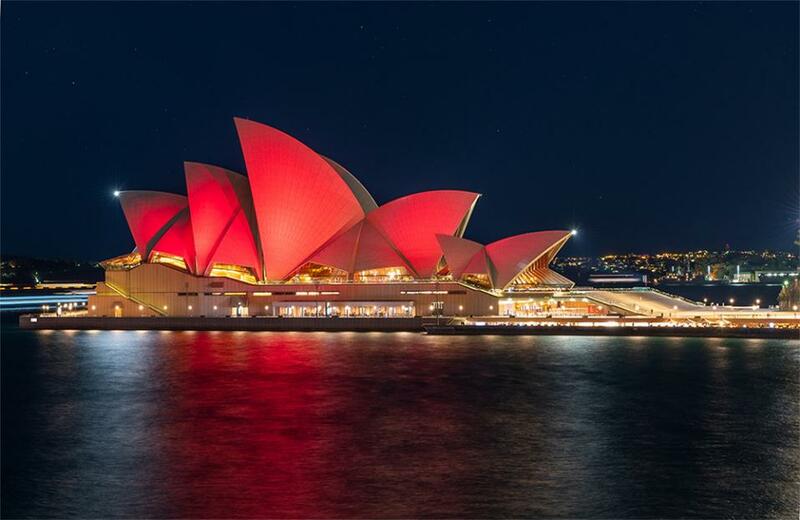 On July 20th 2018, over 225 landmarks across the world Light Up Red for Inclusion – including Sydney Opera House! This global celebration of Special Olympics 50th anniversary brings home how a community made of individuals is actually also a community comprised from the whole world – there is no ‘us and them’ – there’s just 'us', still – always has been, always will be. Special Olympics Australia athletes, volunteers and supporters gathered to celebrate the lighting up of the Sydney Opera House, Special Olympics 50th anniversary and the announcement of Team Australia for the Special Olympics World Games Abu Dhabi 2019. Dame Eunice Mary Kennedy Shriver, DSG (July 10, 1921 – August 11, 2009) was a member of the Kennedy family; she was the sister of President John F. Kennedy and senators Robert F. Kennedy and Ted Kennedy. Her husband, Sargent Shriver, was the United States Ambassador to France during the Lyndon Johnson presidency. In 1962, Shriver founded Camp Shriver, which started on her Maryland farm known as Timberlawn, and evolved into Special Olympics in 1968. To prepare for a day at the first Camp Shriver, athletes stretch on the lawn at Eunice Kennedy Shriver's home in Rockville, MD. A longtime advocate for children's health and disability issues, Shriver was a key founder of the National Institute of Child Health and Human Development (NICHD), a part of the National Institutes of Health in 1962. She has also helped to establish numerous other university programs, government initiatives, health-care facilities, and support service networks throughout the country. In 1961, she championed the creation of the President's Panel on Mental Retardation which was significant in the movement from institutionalization to community integration in the US and throughout the world, a major public policy challenge. In 1982, Shriver founded the Eunice Kennedy Shriver National Center for Community of Caring at University of Utah, Salt Lake City. The Community is a "grades K-12, whole school, comprehensive character education program with a focus on disabilities... adopted by almost 1,200 schools nationwide and in Canada. She was awarded the nation's highest civilian award, the (U.S.) Presidential Medal of Freedom, in 1984 by U.S. President Ronald Reagan, because of her work on behalf of those with intellectual disability. In 1990 Shriver was awarded the Eagle Award from the United States Sports Academy. The Eagle Award is the Academy's highest international honor and was awarded to Shriver for her significant contributions to international sport. In 1992, Shriver received the Award for Greatest Public Service Benefiting the Disadvantaged, an award given out annually by Jefferson Awards. For her work in nationalizing the Special Olympics, Shriver received the Civitan International World Citizenship Award. Her advocacy on this issue has also earned her other awards and recognitions, including honorary degrees from numerous universities. She is the second American and only woman to appear on a US coin while still living. Her portrait is on the obverse of the 1995 commemorative silver dollar honoring the Special Olympics. On the reverse is the quotation, "As we hope for the best in them, hope is reborn in us." Shriver received the 2002 Theodore Roosevelt Award (the Teddy), an annual award given by the National Collegiate Athletic Association to a graduate from an NCAA member institution who earned a varsity letter in college for participation in intercollegiate athletics, and who ultimately became a distinguished citizen of national reputation based on outstanding life accomplishment. In addition to the Teddy recognition, she was selected in 2006 as part of the NCAA Centennial celebration as one of the 100 most-influential individuals in its first century; she was listed ninth. In 2006, she received a papal knighthood from Pope Benedict XVI, being made a Dame of the Order of St. Gregory the Great (DSG). Her mother had been created a papal countess in 1950 by Pope Pius XII. In 2008, the U.S. Congress changed the NICHD's name to the Eunice Kennedy Shriver National Institute of Child Health and Human Development. In December 2008, Sports Illustrated named Shriver the first recipient of Sportsman of the Year Legacy Award. On May 9, 2009, the Smithsonian Institution's National Portrait Gallery (NPG) in Washington, D.C., unveiled an historic portrait of her, the first portrait the NPG has ever commissioned of an individual who had not served as a U.S. President or First Lady. The portrait depicts her with four Special Olympics athletes (including Loretta Claiborne) and one Best Buddies participant. It was painted by David Lenz, the winner of the Outwin Boochever Portrait Competition in 2006. As part of the Portrait Competition prize, the NPG commissioned a work from the winning artist to depict a living subject for the collection. Lenz, whose son, Sam, has Down syndrome and is an enthusiastic Special Olympics athlete, was inspired by Shriver's dedication to working with people with intellectual disabilities. Shriver became involved with Dorothy Hamill's special skating program in the Special Olympics after Hamill's Olympic Games ice-skating win. In September 2010, the State University of New York at Brockport, home of the 1979 Special Olympics, renamed its football stadium after Shriver. Eunice Kennedy Shriver saw people with intellectual disabilities were excluded and routinely placed in custodial institutions. They were often ignored and neglected, yet she knew they had many talents and gifts to offer. Today, Special Olympics supports over 5 million athletes in 177 countries. Special Olympics began in Australia in 1976 in local communities in Melbourne Inner East (VIC), Kempsey (NSW), Gold Coast (QLD) and Launceston (TAS). By helping Special Olympics Australia give opportunities to play sport, we can open the door to personal achievement, pride and inclusion for some of the marginalised and isolated members of our community. With around 668, 000 Australians living with an intellectual disability, and another person diagnosed every two hours, and only 3,000 athletes participating with Special Olympics Australia, your support to increase the reach and spread the joy of sport and community is needed. Like the Olympics and Paralympics, Special Olympics believe in the power of sport to create a better world. Each organisation has a slightly different focus and very different levels of awareness and funding. The Olympics is an iconic and well supported major sporting event for elite athletes. The Paralympics is a major sporting event for elite athletes, mainly with a physical disability with awareness and funding on the rise. Special Olympics is a year-round multi-sports program for people with an intellectual disability – of all capabilities – who also have access to robust competition pathways including our World Games which is hosted on a four-year cycle in summer and winter sports. We still haven’t had our time to shine in awareness and funding. Special Olympics is the only organisation authorised by the International Olympic Committee to use the word "Olympics". This authorisation is enshrined in a Protocol of Agreement signed in 1988. Generally speaking, people with an intellectual disability find it hard to do what are considered basic tasks, like reading, handling money or catching public transport. It doesn't mean that they can’t learn to do these things, they just may learn differently or need more time and support to succeed. Unlike those with a physical disability, it is not always obvious when a person has an intellectual disability. What is obvious at Special Olympics Australia is that many have hidden talents that sport can help them uncover. The Special Olympics World Summer Games will be held in Abu Dhabi, UAE from 8-21 March 2019, with 7,000 athletes with an intellectual disability from 170 nations competing across 24 sports in front of half a million spectators. Pittwater's Alyse Saxby (Sailability Crystal Bay) is part of Team Australia 2019 and will be sailing her heart out again. "I'm looking forward to doing Australia proud, meeting new people and catching up with friends from other countries." says Alyse. Join us at the 13th annual Special Olympics Australia Signature Dinner (formerly known as the Variety Dinner). Hosted by one of Australia’s most respected music directors, long-term friend and Ambassador Mr John Foreman OAM, we promise you a great night of fun-filled entertainment with outstanding guest performers including, Dami Im, 2016 2nd place in the Eurovision; Iva Davies AM, Icehouse front man; Talent Development Program performers, Australian Actress and Comedian; the Special Olympics Dance Performance Group and many more! In 2018 the theme for the event is 'This is Me' from the hit musical The Greatest Showman. Iva Davies AM, Dami Im, Special Olympics Dance Performance Group, Rhonda Burchmore, Grace Knight, Talent Development Project, and many more! Providing weekly sports training and regular competition for people with an intellectual disability. Everyone's welcome!